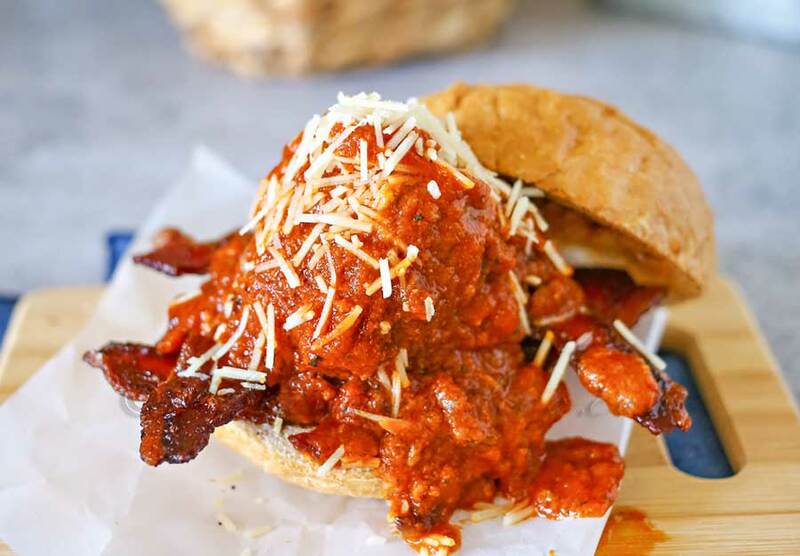 Kick up your classic meatball sandwich & add some crispy bacon like this Bacon Meatball Sandwich that is positively the best bacon for dinner recipe ever. Do you love comfort food? 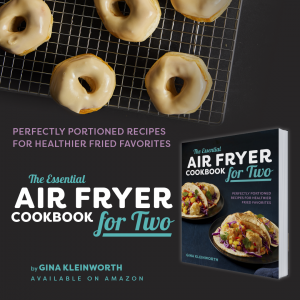 I’m talking some down home – smothered in yummy goodness comfort food. Yep – me too. 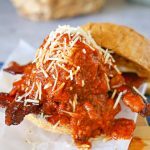 Which is why when we were working on more recipes for bacon month I just had to make some of our favorite meatball sandwiches with a whole lot of bacon added in there. Holy smokes – what a great combo that you wouldn’t normally think of – but man it was so delicious. Fortunately we made a double bacth of these colossal meatballs so just one or two filled us up & we had plenty left over for the next night too. Gotta love leftovers – especially when they are as good as this. YUM! 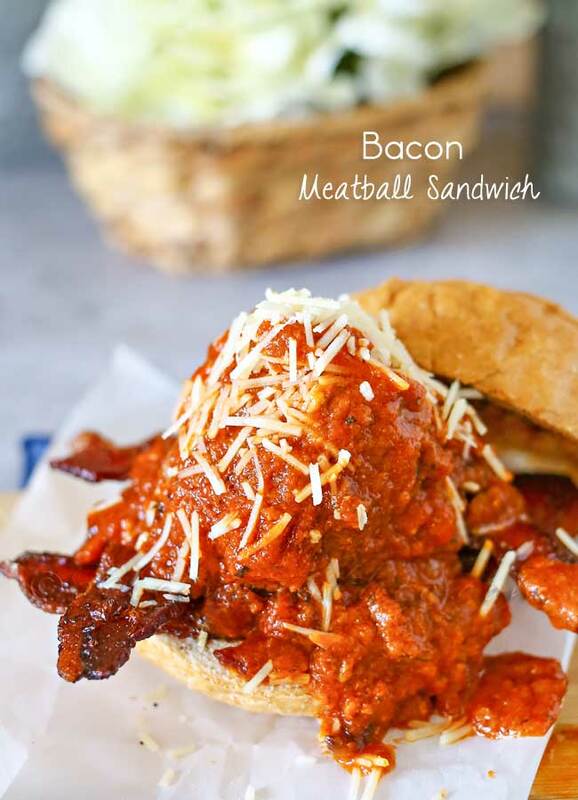 Just look at all that delicious marinara all over that giant meatball & bacon. WOW it was good. Be sure to toast your bread – just slightly. It’s easy to do by just rubbing the inside part in a hot skillet. It keeps the marinara from soaking in so quickly & makes it easier to eat. Now the amount of marinara & cheese you add to your final sandwich is entirely up to you. 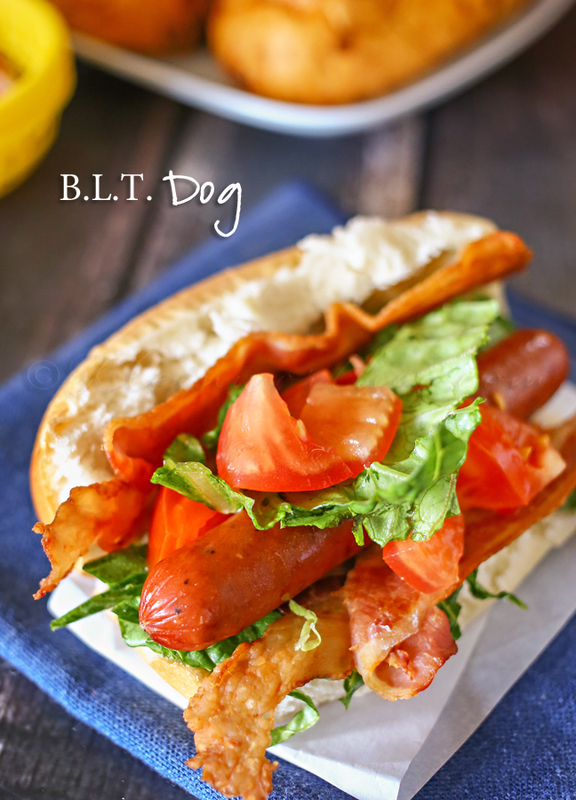 But when it comes to this deliciousness – I couldn’t help but load it up. Combine meat, bread crumbs, parsley, egg, milk, tomato paste, Parmesan cheese, granulated garlic, minced onions, salt & pepper in large bowl. Once oil is hot, gently place meatballs in skillet & cook about 2 minutes before rolling to continue cooking another side. Cook until most of the meatball surface has been cooked -if you are working in batches transfer cooked meatballs to a plate lined with paper towels. 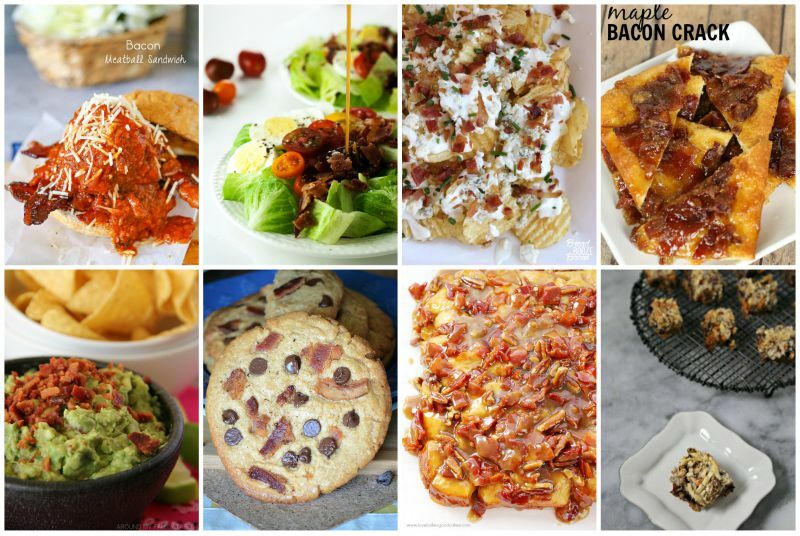 Don’t miss these from my fellow bacon loving bloggers joining in on bacon month!! 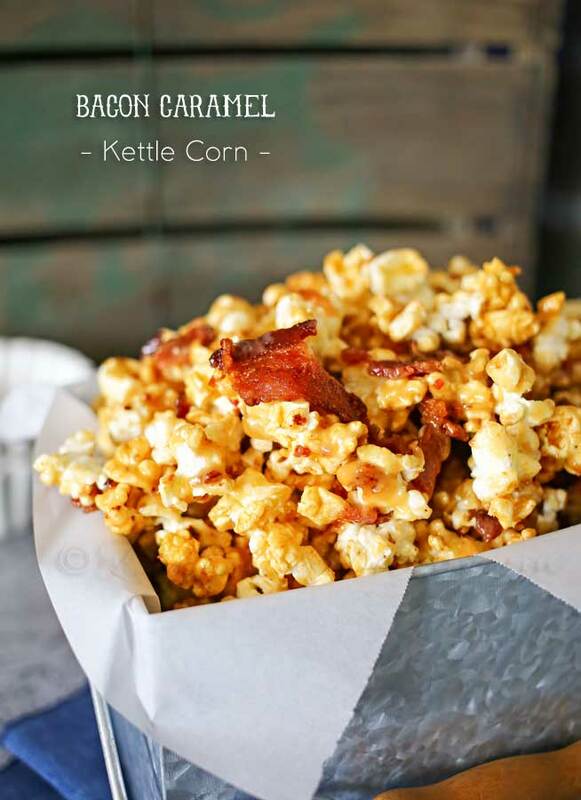 Don’t forget to enter to win our AWESOME bacon giveaway!!! 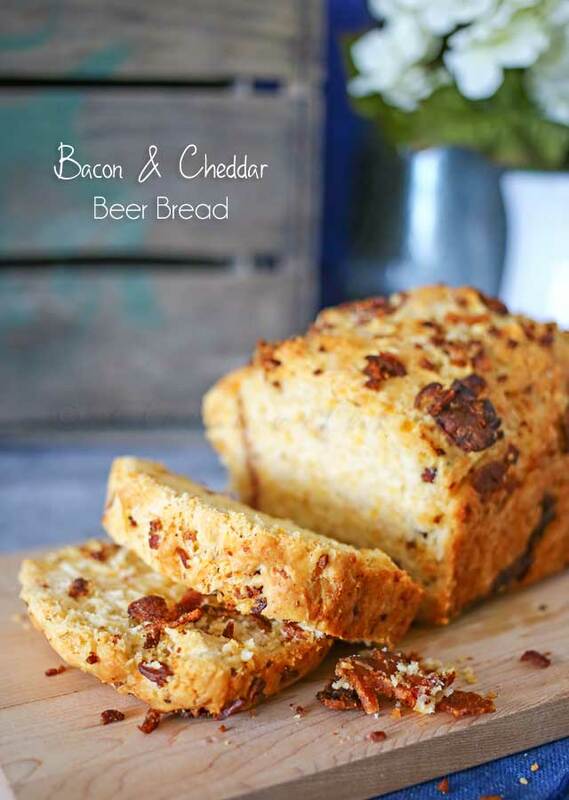 Looking for even more great bacon recipes? 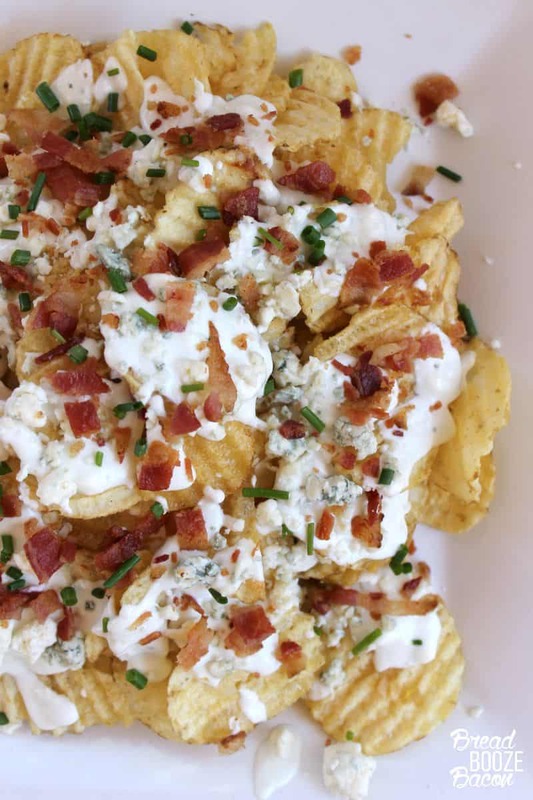 This looks like a delicious way to enjoy bacon. YUM! My boys would devour these!